U.S. officials said the girl's family ties to the Taliban mean it's too dangerous to identify her or her uncle, who accompanied her to the Bagram base hospital. NPR is calling her Ameera. If Ameera had gone to an Afghan clinic, "she'd definitely have had an amputation — and rightly so," said Dr. Chance Henderson, a Texas-born orthopedic surgeon who has been treating her. "That is the best way to save her life if you don't have the means available to do what we have done in 12 or 20 surgeries." 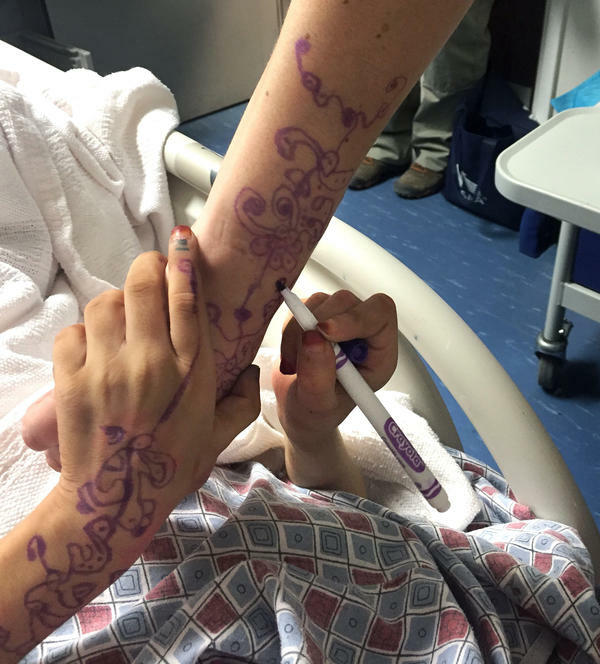 Preserving Ameera's leg not only could save her from the danger posed by her immediate wound, Henderson said. It would also save her from the dangers of having to return to life in Afghanistan without it. Air Force 1st Lt. Serena Matson remembered Ameera's "nonstop crying" when she came in. "She is little," Matson said. "She does not know us. We are not familiar-looking, and there are just a lot of people in and out of the room. She was just scared. 'Who are these strange people? They don't look like me. Where is my family?' "
Now Matson is braiding Ameera's hair, learning a few Pashto words and teaching the girl a little English. 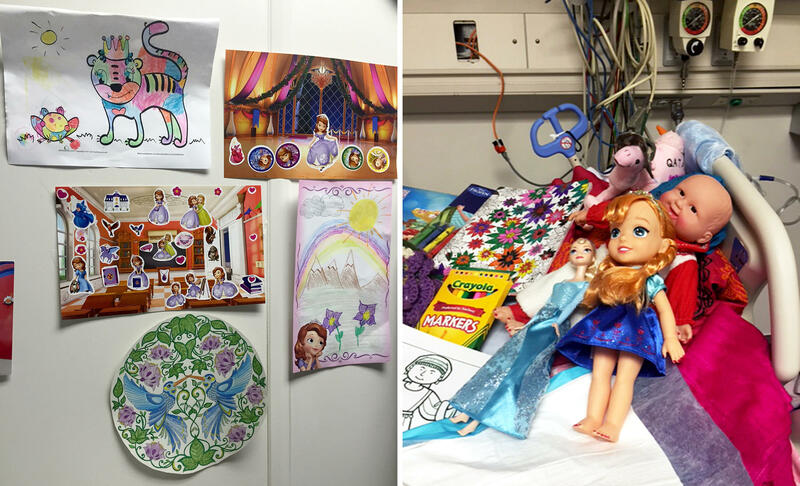 She receives care packages from around the U.S., including one from a kindergarten class in Texas. But even though Ameera survived her ordeal and has found her spirits revived, the outlook for keeping her leg is not clear. Henderson called the chances for saving it little better than a coin toss, until he consulted with specialists back home and tried a procedure that directed blood flow from Ameera's healthy right leg to the wound on her left leg. "My daughter — that's the first thing she asks me," Henderson said. "'How's the leg doing, Dad?' I do not want to give her bad news." The U.S. military hospital at Bagram Airfield isn't very busy these days. Most American troops are safely working as trainers inside large bases. So the focus of the hospital staff is on sports injuries, except for one patient, a 6-year-old girl caught in the crossfire with U.S. and Afghan soldiers and Taliban fighters. NPR's Tom Bowman reports that doctors are fighting to save her leg. TOM BOWMAN, BYLINE: She's curled up in a hospital bed, her tiny frame with a mop of reddish-brown hair is almost lost in a mound of blankets. There's a stuffed Nemo doll on the shelf, crayon drawings on the wall. And her uncle is next to her sitting on an EasyChair, where he sleeps every night. UNIDENTIFIED MAN: (Through interpreter) She got hurt, innocent. And I look at her, and it makes me really devastated to see her in that situation. BOWMAN: His eyes are red, and his face is lined and worn. He wears a long, black shirt and pants and speaks through an interpreter. For security reasons, we can't use his name or hers. So we'll call her Ameera. UNIDENTIFIED MAN: (Through interpreter) I feel that she was about to start crying, but I pat her on the head and then gave her moral that I'm here. BOWMAN: He's one of her closest remaining relatives. Ameera's father, a Taliban fighter, along with her mother and some siblings, officials say, were killed in the skirmish involving American forces. And that's why she's here at this U.S. hospital because her injuries came as a result of a fight involving Americans. And while Ameera survived, it's not certain whether her left leg will. A bullet sliced into it, shattering her bone and tearing off her calf muscle. CHANCE HENDERSON: I saw a terrible leg wound with exposed bone, with a 10-centimeter by 10-centimeter, probably, wound with missing skin and a lot of missing muscle from a gunshot wound. BOWMAN: That's Dr. Chance Henderson. The slow drawl reflects his roots in Paris, Texas. 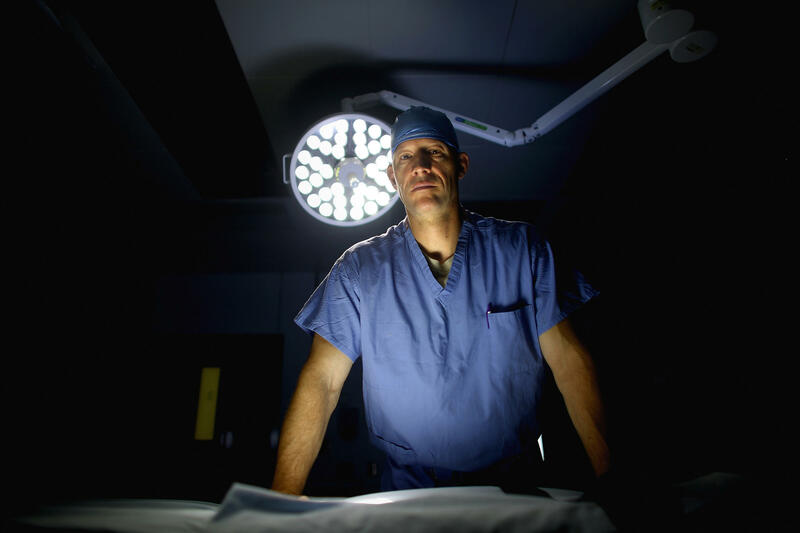 He was a rodeo rider, turned fighter pilot, turned orthopedic surgeon. He's also the father of three kids, one of them close to Ameera's age. HENDERSON: You can imagine. I mean, you fear that could be your own kid. And, you know, immediately, you have to rely on your training to kind of fallback on, OK, what are the steps? Don't let your emotions overrun your brain. But, you know, throughout the time I've been taking care of her, it's like taking care of your own kid. BOWMAN: Dr. Henderson says Ameera's so far had a dozen operations to save her leg. Her outlook would've been different if she arrived at an Afghan hospital. HENDERSON: She'd definitely have an imputation. I mean, that is - and rightly so - a best way to save her life if you don't have the means available to you - do what we've done and 12 or 20 surgeries later save her leg is to save her life. And then her outlook on a life as a single amputee that doesn't have a family is much different than it would be for us in the states. Her future would be grim and probably her lifespan would be short. BOWMAN: Her wound is not unusual. The U.N. reported in February that civilian casualties are on the rise, and most of them are caused by the Taliban. The U.N. found that 1 in 4 casualties was a child. Ameera was bewildered when she first arrived at a strange place surrounded by foreigners. SERENA MATSON: So when she first came in, every single day, you would just hear her crying, not nonstop but you kind of got used to the crying. BOWMAN: Air Force 1st Lt. Serena Matson is one of the nurses who helped care for Ameera. MATSON: And every time someone would go into the room, you know, she's little. She doesn't know us. We're not familiar-looking, and there's just a lot of people in and out of her room. So I feel like a lot of her crying, she was just scared. You know, who are these strange people? They don't look like me. Like, where is my family? BOWMAN: As the days and weeks passed, the staff did what they could to make her feel comfortable. There were toys and crayons, movies like "Frozen," Mickey Mouse cartoons. They saw a drastic change. MATSON: She'll let us go in, braid hair, like, paint her fingernails. And she smiles now, whereas before, she wouldn't. BOWMAN: They all started understanding each other. The translator would teach the nurses simple phrases in Pashto. MATSON: We have tried to learn to tell her, you know, like, that she's pretty, little things like that. But she actually understands. You know, like when we say change, she knows, she'll lift up her hips and so we can help change her. BOWMAN: Word spread around the base about Ameera. And she started receiving care packages from the U.S., including one from a kindergarten class from Texas. Even with all her surgeries, the chances for saving her leg were seen as little better than a coin toss. Then Dr. Henderson tried something different after he consulted with some of the best specialists he knew back home. HENDERSON: If we take one leg and attach it to the other leg via a piece of skin over that wound and essentially made a little mermaid out of her. BOWMAN: Her chances of keeping her leg, he said, rose to 80 percent. HENDERSON: You hope the blood will flow in from the bad leg, the left, to that flap of skin so you can cut it off the right leg and leave it permanently attached to the bad leg. BOWMAN: Now the waiting begins. And Dr. Henderson says everyone is asking him the same question, including his family. HENDERSON: My daughter's name is Katie Bow (ph). And that's the first thing she asks me is how's the leg doing, Dad? I do not want to give her bad news. BOWMAN: Ameera will still have to undergo at least two more surgeries. Dr. Henderson says it could take another month before he knows for sure whether she can keep her leg. Tom Bowman, NPR News, Bagram Airfield, Afghanistan. Transcript provided by NPR, Copyright NPR.